Rainer Zitelmann holds doctorates in history and sociology. He is the author of 21 books. After working as a historian at the Freie Universität Berlin, he later served as section head at the daily newspaper "Die Welt." In 2000, he founded his own company, which he subsequently sold in 2016. Today he lives in Berlin as an investor and publicist. The material in this book is based on his second doctoral dissertation. 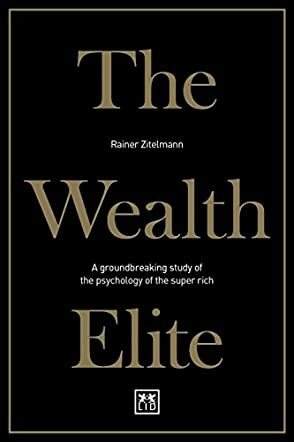 The Wealth Elite: A Groundbreaking Study of the Psychology of the Super Rich by Dr. Rainer Zitelmann is a non-fiction book or rather a study on what makes some of the world’s wealthiest self-made millionaires stand out from other people, and what are their common traits - if any - that helped them achieve such success and wealth. This book was originally an academic study as part of a doctoral dissertation and that shows in the meticulousness of the research and structure of the book. The book is divided neatly into several sections including the state of existing research on this subject, the role of luck, personality characteristics of self-made wealthy entrepreneurs, the methodology followed in this book of guided interviews, and finally interview excerpts from 45 wealthy people on what sets them apart, and the subsequent findings and conclusions from it. I thoroughly enjoyed reading The Wealth Elite and found some of the findings quite interesting. The part I liked the most was actual interview excerpts presented verbatim, which really helps one to understand exactly what the interviewer is trying to say in their own words. Zitelmann’s writing style is effortless and engaging and makes this a fun read. My only suggestion for similar future projects would be to limit research to those people who come from families whose household income was middle class or below, which rules out anyone “born into wealth.” Secondly, I would be very curious to learn more about female entrepreneurs and their own journeys because one reason why the male-to-female ratio of self-made entrepreneurs is so skewed is due to unequal opportunities and freedom growing up. All in all, this is a very interesting book that I enjoyed reading.